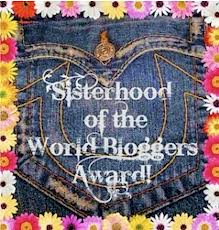 I am so grateful to Mo, the Crazy Crone at the http://thecrazycrone.com/, for nominating me for this award. Her blog has inspired me on bright days and dreary days and I always learn something profound and something delightfully silly. It is a pleasure to share cyberspace with these other creative and honest sisters along the way. I invite you to visit their blogs and be assured that you are in for a treat. ◾ Thank the person who nominated you. ◾ Share 7 things about yourself. l Your favourite animal… my Rosie Posie, of course, the most fastidious, fickle feline in the world. Your favourite non-alcoholic drink ….tomato juice, especially when I need an electrolyte fix. Facebook or Twitter …. love FB because I keep up with nieces and nephews far away. Your favourite pattern …..the spiral of the nautilus shell invites me into deep places. Do you prefer getting or giving presents?…when I make something lovely for someone I can barely wait to give the gift. Your favourite number …I could be theological and say 7, the perfect number, but it’s 8 and I have no idea why. Your favourite day of the week …Sunday is my day to be nurtured by my Mennonite companions at such a rich service. I love it. Your favourite flower ….Pink and violet Christmas cacti, because they make me hope in a dark time. What is your passion?....My passion jumps out on the pages I write like a lover of long faithful standing. Give me pen and paper and I am ecstatic. *I spelled favorite, “favourite” the British way because I am under the spell of the Crazy Crone. Aha, nice to see the English language being honoured, Rita!!! And also I love Christmas cacti, one of the few plants which manage to survive under my tutelage.